With our rich industrial experience, we hold expertise in offering Glass Partition Services. These services are executed within the pre-specified time limits. The creative team of professionals is rendered these services according to the client’s requirements at very affordable and cost effective market rates. We are renowned organizations of market for presenting the optimum quality range of Glass Partition Service. Our organization has created a niche in the market as a leading provider of quality proven range of Glass Partition Work. These services are precisely offered in accordance with the set industry rules as per the need of our clients. These services are rendered under the direction of experienced professionals. Woodfur Art And Design Pvt. Ltd.
Banking on the understanding our personnel have received in the years, we are engrossed in the business of offering Toughened Glass Partition Work to our clients. Credited due to their reasonable rates, these services are widely appreciated amongst our clients. More to this, our adroit workers are rendering these services in the most planned manner. We have carved a niche as a service provider of the finest quality Glass Partition Services. 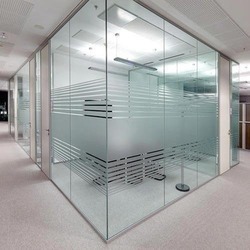 Capitalizing on the ability of our well-trained workforce, we are readily engaged in providing world-class Framed Office Glass Partition Service. A team of well- trained staffs is offering these services as per the thorough demands of our clients. We believe in offering precise solution of client’s needs and assist them accordingly. To maintain the status we have achieved in this domain, we are engaged in rendering high quality Aluminum Glass Partition Service. Widely demanded in the market for their economical rates, the provided services can also be availed in modified solutions. Owing to our sound relationships with one of the leading vendors of the domain, we are instrumental in offering a premium range of Office Glass Partition Services. Capitalizing on the ability of our well-trained workforce, we are readily engaged in providing world-class Toughened Glass Partition Service. A team of well-trained staffs is offering these services as per the thorough demands of our clients. We believe in offering precise solution of client’s needs and assist them accordingly. With rich industry experience and knowledge, we are involved in offering Aluminium Glass Partition Service. - Suitable for office, hotel, etc. Sound rated or fire rated partitions curtain walling to suit all applications. Match your existing or create a completely new look. Solid panels, half glazed and fully glazed systems in Straight line, curved partitions are installed. All systems designed to comply with Building/Planning regulations and fire regulations.